One of the supreme pleasures in making cakes is getting to see the reaction on people's faces when they see their cake for the first time, and kids, bless their hearts, tend to have a strong immediate reaction. 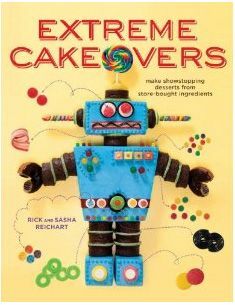 Their eyes get larger, out comes their toothy awkward smile and then they want to get a little closer and reach out and try and touch the cake. Parents know this and they are often right there to guard the cake table. Some of our favorite cake memories have involved children. 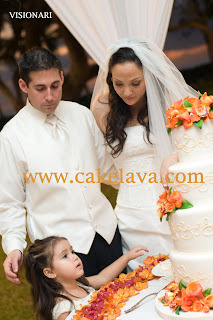 Parents seem to enjoy the cake ritual with their child, often having to lift them up to blow out the candles. 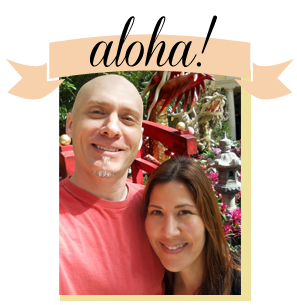 The Ohana album on our website is a celebration of people's reactions to the cakes. Cakes are usually delivered prior to the start of the event when things are quiet and the real party happens after we leave. 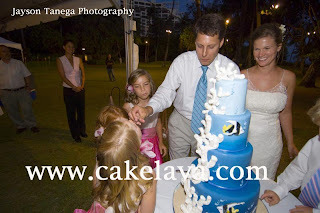 We're thankful to all the parents who continue to send us their Ohana photos showing how happy they and their children are with their cakes. This photo is heartwarming. A mother with her daughter, enjoying their "messy" cake for their get messy themed birthday party. Colorful and all edible, even the inside of the cake was colored, pink, Guava Lava. Now that's a reaction! 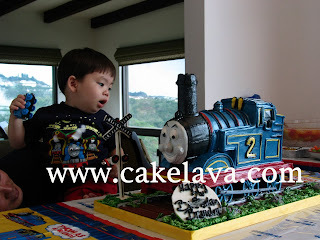 He was a big fan of Thomas the Tank Engine and according to his mommy, he enjoys seeing his cake on our website and says "My Thomas, My cake!" So cute! Kids can be just as precious at weddings. Although this was the couple's special day, it meant so much to be able to share their cake cutting ceremony with their daughter. This little girl is PDC (pretty darn cute)! 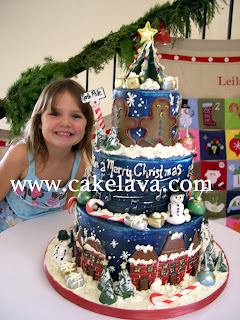 She was very excited about her cake for her family's Christmas party -- love the big toothy grin!